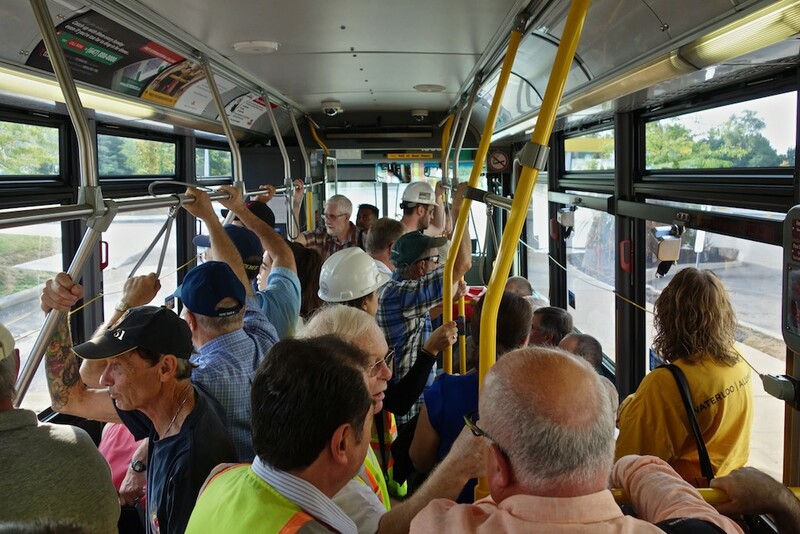 Lots of people made standing room only bus trips this morning to witness the Kodak building’s big move of about 200 feet. Built in 1939, Building 9 as it is known, contained a gym and cinema / theatre among other things. It is the last of the buildings to survive and the community pressed hard for its preservation in some meaningful form. 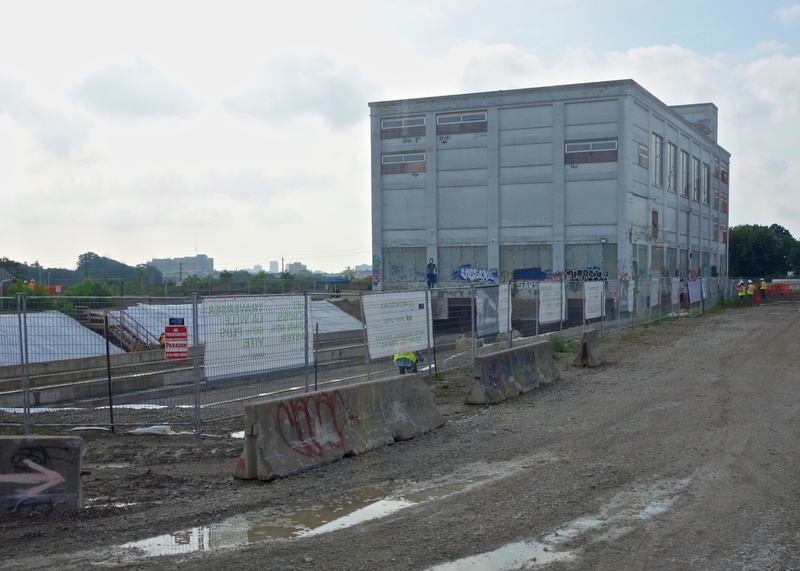 The stars aligned, politicians and Metrolinx listened and plans are under way to make Building 9 (now basically an empty shell thanks to vandalism) a key feature of an LRT station and mobility hub planned for Mount Dennis. Buses were chartered from the TTC by Metrolinx in response to the anticipated demand to see this famous local landmark being prepared for a starring role once more. It’s standing room only on the 8:30 am shuttle bus. A large crowd filed onto the bleachers that had been set up for the occasion. On this warm and steamy morning, there was an added promise of lunch after the move. 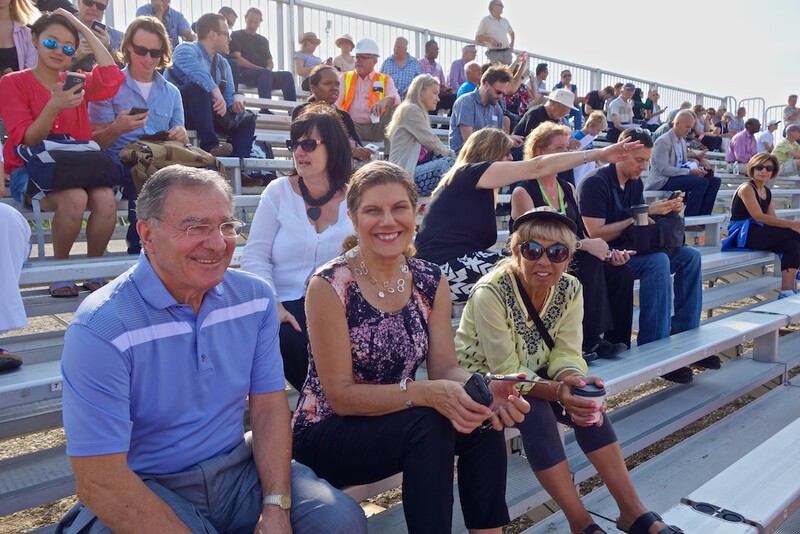 Councillor Frank DiGiorgio, MPP Laura Albanese and Councillor Frances Nunziata (front row L to R) watch the move from the bleachers. One thing not made clear by recent articles and certainly not clear to me until today (is it me?) is that the Kodak Building will return to its original location. The building inching towards us along rails to its temporary location. The idea is that the building’s current basement is inadequate for its future role as the main access point for the Eglinton LRT, UP Express and a bus terminal. The building is being moved off to one side while the old basement is demolished and a new one built from scratch. 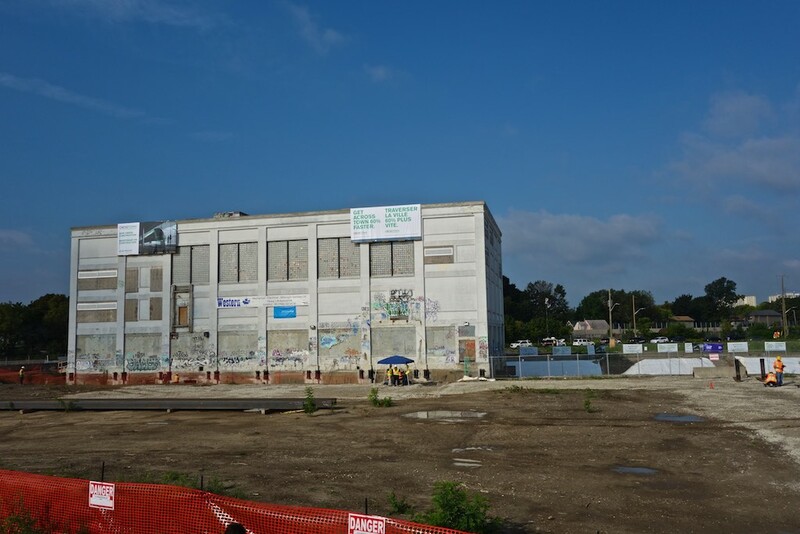 Once the work is done, the Kodak building will return to its old location on the new foundation. Today, many former Kodak employees were in attendance along with Weston and Mount Dennis residents and the mood was one of celebration. A large contingent from Metrolinx helped with making sure everything went smoothly. 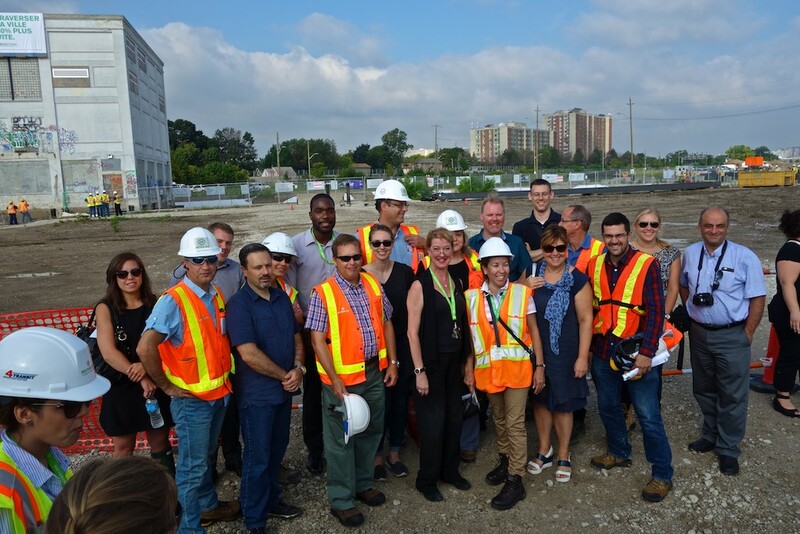 Metrolinx workers pose to mark the occasion as the building moves along slowly. The building inches along its rails. There are many more fascinating details of the plans for Building 9 and how it will be part of an exciting transportation future. Read all about it here. The preservation of part of Mount Dennis history is a mark of respect for an alert and politically active community. No doubt we’ll be doing the whole thing in reverse in about a year when the basement is completed. Well done to Metrolinx for organizing a great day and allowing the community to celebrate the occasion.